RAIN OR SHINE OUR COVERED FLUME IS OPEN! "Your special memories are waiting for you"
Our gem bags are especially designed for our visitor’s different preferences. There are treasure bags, fossil bags, regular gem bags, “rock hound” bags, and family packages. Beginners & seasoned miners, children and adults have ALL enjoyed the gems and treasures from mines around the world. Rock hound bags have ALL rough stones and precious and semi-precious gems including emeralds, sapphires, and rubies. Our most avid rock hound guests RAVE about our selection of stones! Citrine ♦ moonstone ♦ rose and smoky quartz ♦ amethyst ♦ tiger eyes ♦ snowflake obsidian ♦ jasper ♦ tourmaline ♦ calcite ♦ agate ♦ septarian ♦ crystals, aventurine ♦ labradorite ♦ unakite ♦ petrified wood ♦ sodalite ♦ peacock ore ♦ hematite ♦ fluorite ♦ apatite ♦ emeralds ♦ and lots more. The treasure bags have great surprises to delight the kids in addition to gems. Our new fossil bags have a combination of fossils and gemstones. Beware; you can become a “rock hound” before you know it and you will want MORE! 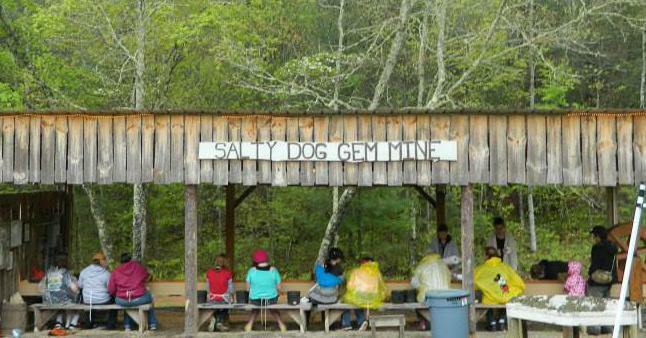 You don’t have to be a kid to have a GREAT time at the Salty Dog Gem Mine at Wagonmaster Ranch Resort. Covered water flume with lighting and fans for all weather. Discounts for Church groups, family reuinions, birthday parties and other groups. 10% off to law enforcement, active military, and seniors over 65. The gold is shipped from a gem mine established in 1847.
in the world in its natural form @ 98.7 pure. Ask about our Gift Certificates or Gem bags to go. We ship EVERYWHERE in the U.S.. Call for details.